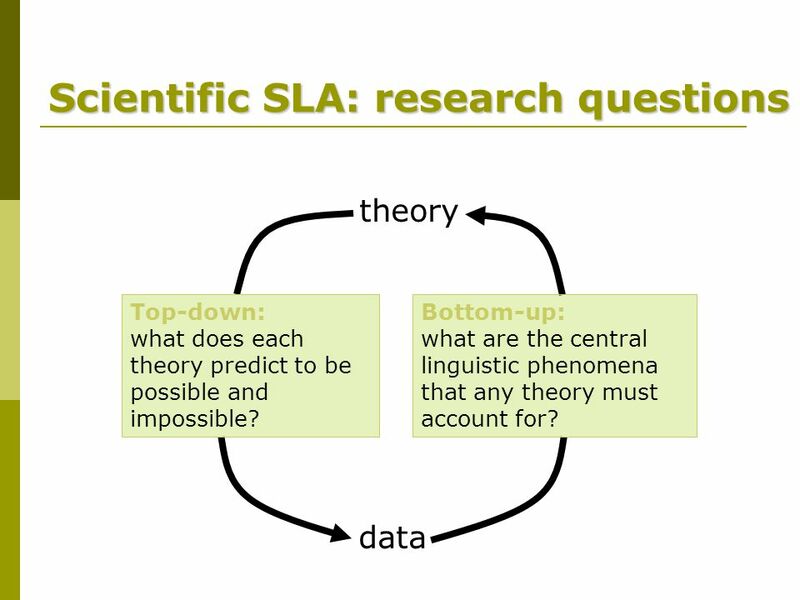 3 Scientific SLA: research questions theory data Top-down: what does each theory predict to be possible and impossible? Bottom-up: what are the central linguistic phenomena that any theory must account for? 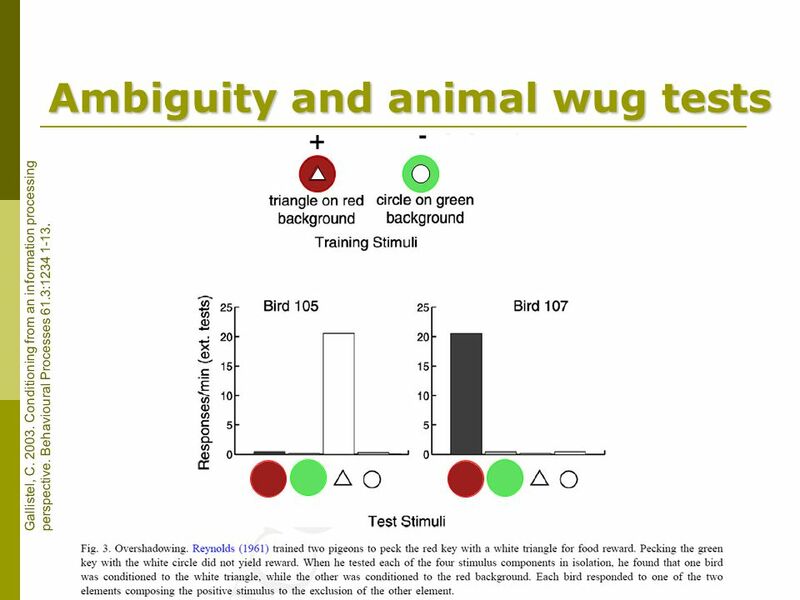 15 Ambiguity and animal wug tests Gallistel, C. 2003. Conditioning from an information processing perspective. Behavioural Processes 61.3:1234 1-13. 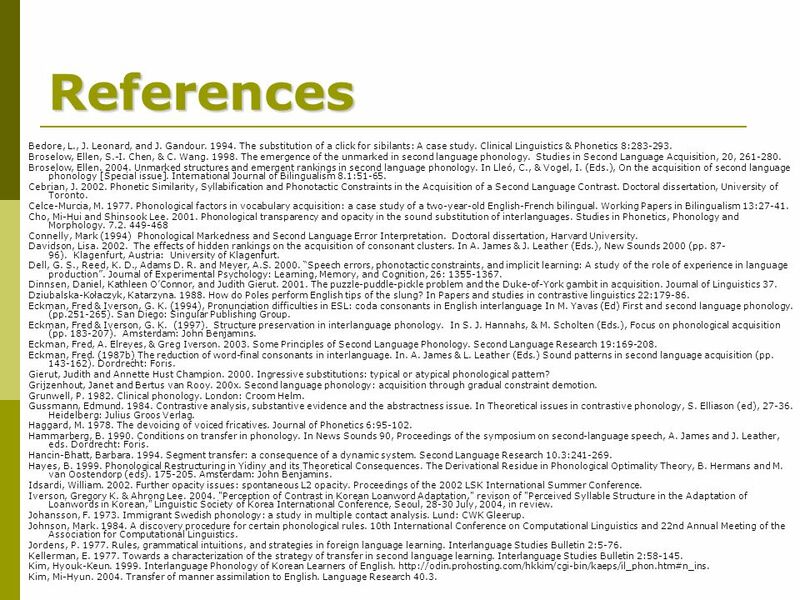 26 References Bedore, L., J. Leonard, and J. Gandour. 1994. The substitution of a click for sibilants: A case study. Clinical Linguistics & Phonetics 8:283-293. Broselow, Ellen, S.-I. Chen, & C. Wang. 1998. The emergence of the unmarked in second language phonology. Studies in Second Language Acquisition, 20, 261-280. Broselow, Ellen. 2004. 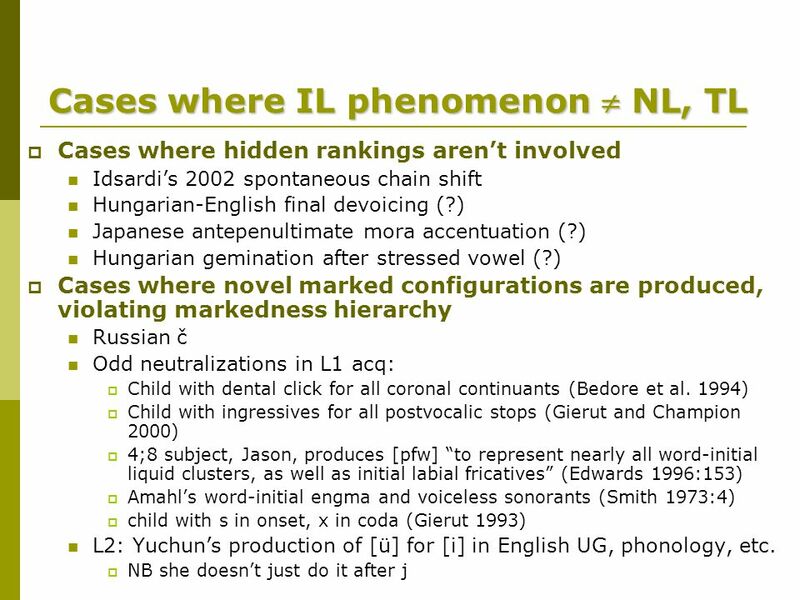 Unmarked structures and emergent rankings in second language phonology. In Lleó, C., & Vogel, I. (Eds. 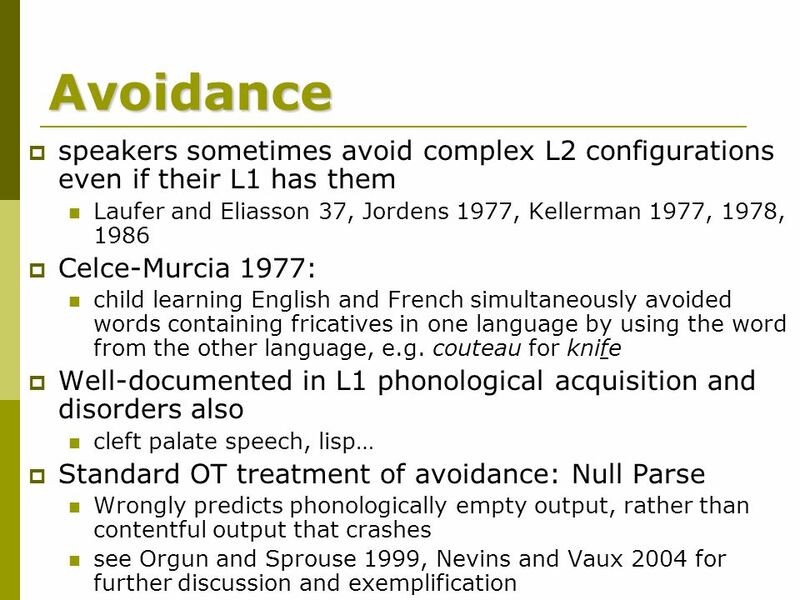 ), On the acquisition of second language phonology [Special issue]. International Journal of Bilingualism 8.1:51-65. Cebrian, J. 2002. Phonetic Similarity, Syllabification and Phonotactic Constraints in the Acquisition of a Second Language Contrast. Doctoral dissertation, University of Toronto. Celce-Murcia, M. 1977. 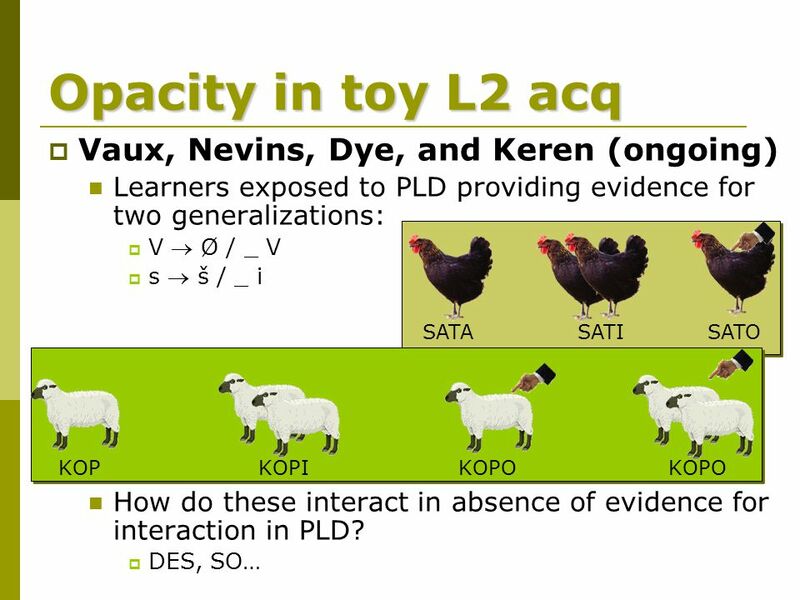 Phonological factors in vocabulary acquisition: a case study of a two-year-old English-French bilingual. Working Papers in Bilingualism 13:27-41. Cho, Mi-Hui and Shinsook Lee. 2001. Phonological transparency and opacity in the sound substitution of interlanguages. Studies in Phonetics, Phonology and Morphology. 7.2. 449-468 Connelly, Mark (1994) Phonological Markedness and Second Language Error Interpretation. Doctoral dissertation, Harvard University. Davidson, Lisa. 2002. The effects of hidden rankings on the acquisition of consonant clusters. In A. James & J. Leather (Eds. ), New Sounds 2000 (pp. 87- 96). Klagenfurt, Austria: University of Klagenfurt. Dell, G. S., Reed, K. D., Adams D. R. and Meyer, A.S. 2000. “Speech errors, phonotactic constraints, and implicit learning: A study of the role of experience in language production”. Journal of Experimental Psychology: Learning, Memory, and Cognition, 26: 1355-1367. Dinnsen, Daniel, Kathleen O’Connor, and Judith Gierut. 2001. The puzzle-puddle-pickle problem and the Duke-of-York gambit in acquisition. Journal of Linguistics 37. Dziubalska-Kołaczyk, Katarzyna. 1988. How do Poles perform English tips of the slung? In Papers and studies in contrastive linguistics 22:179-86. Eckman, Fred & Iverson, G. K. (1994), Pronunciation difficulties in ESL: coda consonants in English interlanguage In M. Yavas (Ed) First and second language phonology. (pp.251-265). San Diego: Singular Publishing Group. Eckman, Fred & Iverson, G. K. (1997). Structure preservation in interlanguage phonology. In S. J. Hannahs, & M. Scholten (Eds. 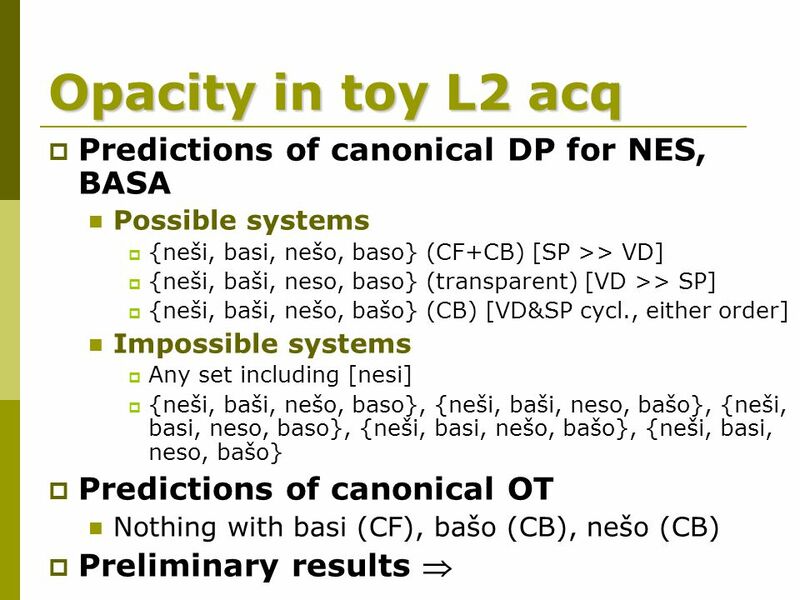 ), Focus on phonological acquisition (pp. 183-207). Amsterdam: John Benjamins. Eckman, Fred, A. Elreyes, & Greg Iverson. 2003. Some Principles of Second Language Phonology. Second Language Research 19:169-208. Eckman, Fred. (1987b) The reduction of word-final consonants in interlanguage. In. A. James & L. Leather (Eds.) Sound patterns in second language acquisition (pp. 143-162). Dordrecht: Foris. Gierut, Judith and Annette Hust Champion. 2000. Ingressive substitutions: typical or atypical phonological pattern? Grijzenhout, Janet and Bertus van Rooy. 200x. 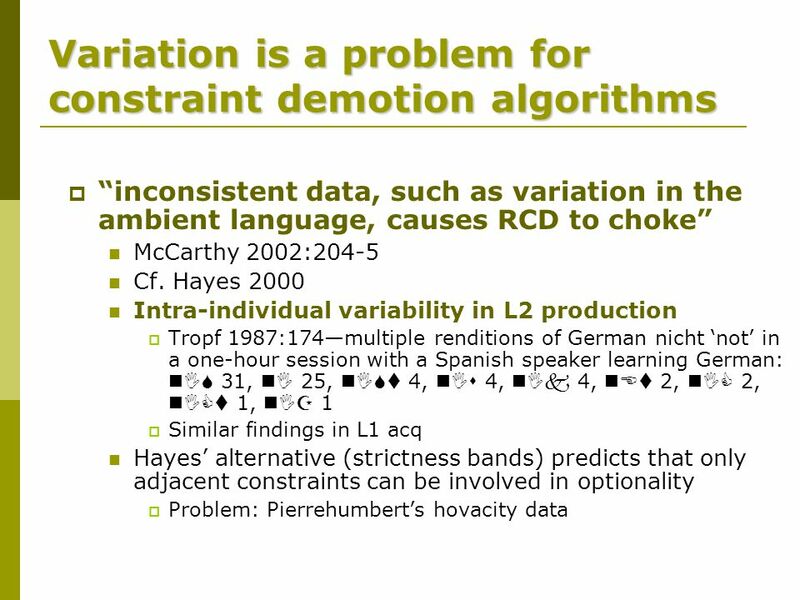 Second language phonology: acquisition through gradual constraint demotion. Grunwell, P. 1982. Clinical phonology. London: Croom Helm. Gussmann, Edmund. 1984. Contrastive analysis, substantive evidence and the abstractness issue. In Theoretical issues in contrastive phonology, S. Elliason (ed), 27-36. Heidelberg: Julius Groos Verlag. Haggard, M. 1978. The devoicing of voiced fricatives. Journal of Phonetics 6:95-102. Hammarberg, B. 1990. Conditions on transfer in phonology. In News Sounds 90, Proceedings of the symposium on second-language speech, A. James and J. Leather, eds. Dordrecht: Foris. Hancin-Bhatt, Barbara. 1994. Segment transfer: a consequence of a dynamic system. 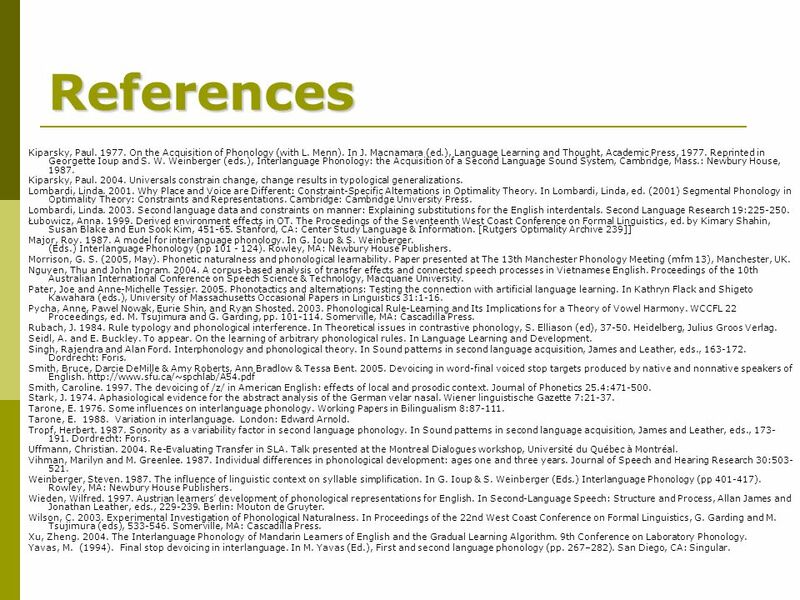 Second Language Research 10.3:241-269. Hayes, B. 1999. Phonological Restructuring in Yidiny and its Theoretical Consequences. The Derivational Residue in Phonological Optimality Theory, B. Hermans and M. van Oostendorp (eds). 175-205. Amsterdam: John Benjamins. Idsardi, William. 2002. Further opacity issues: spontaneous L2 opacity. Proceedings of the 2002 LSK International Summer Conference. Iverson, Gregory K. & Ahrong Lee. 2004. 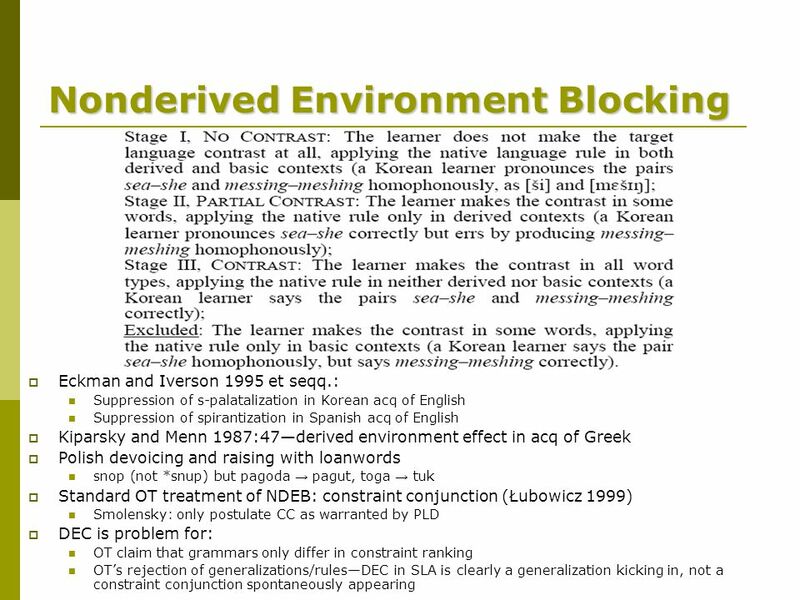 "Perception of Contrast in Korean Loanword Adaptation," revison of "Perceived Syllable Structure in the Adaptation of Loanwords in Korean," Linguistic Society of Korea International Conference, Seoul, 28-30 July, 2004, in review. Johansson, F. 1973. Immigrant Swedish phonology: a study in multiple contact analysis. Lund: CWK Gleerup. Johnson, Mark. 1984. A discovery procedure for certain phonological rules. 10th International Conference on Computational Linguistics and 22nd Annual Meeting of the Association for Computational Linguistics. Jordens, P. 1977. Rules, grammatical intuitions, and strategies in foreign language learning. Interlanguage Studies Bulletin 2:5-76. Kellerman, E. 1977. 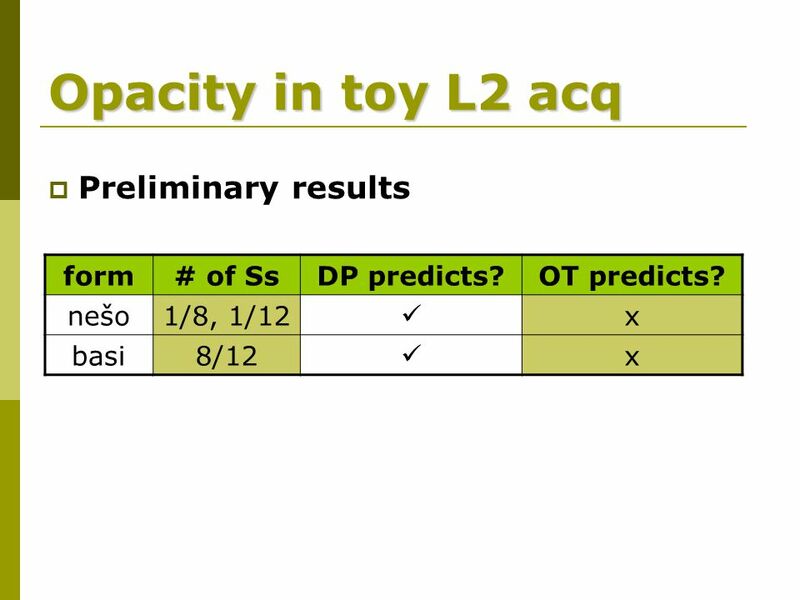 Towards a characterization of the strategy of transfer in second language learning. Interlanguage Studies Bulletin 2:58-145. Kim, Hyouk-Keun. 1999. Interlanguage Phonology of Korean Learners of English. http://odin.prohosting.com/hkkim/cgi-bin/kaeps/il_phon.htm#n_ins. Kim, Mi-Hyun. 2004. Transfer of manner assimilation to English. Language Research 40.3. 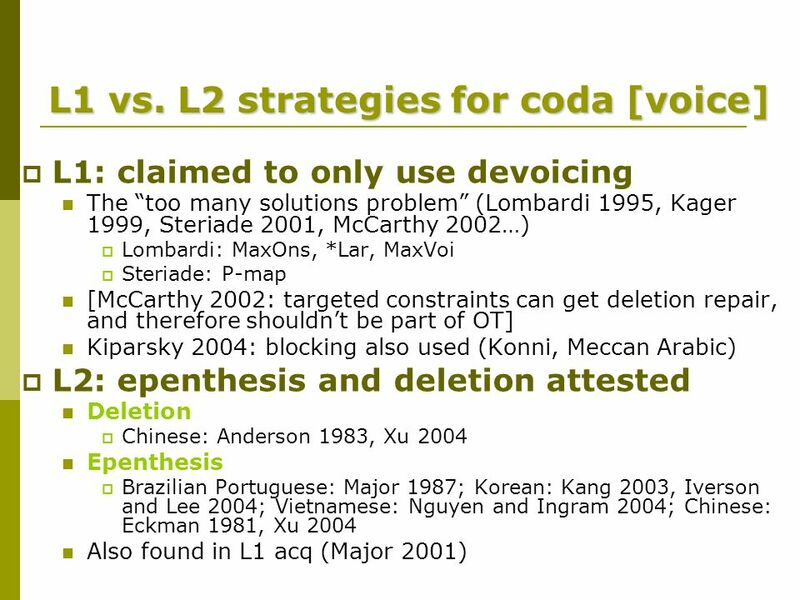 27 References Kiparsky, Paul. 1977. On the Acquisition of Phonology (with L. Menn). In J. Macnamara (ed. ), Language Learning and Thought, Academic Press, 1977. Reprinted in Georgette Ioup and S. W. Weinberger (eds. ), Interlanguage Phonology: the Acquisition of a Second Language Sound System, Cambridge, Mass. : Newbury House, 1987. Kiparsky, Paul. 2004. 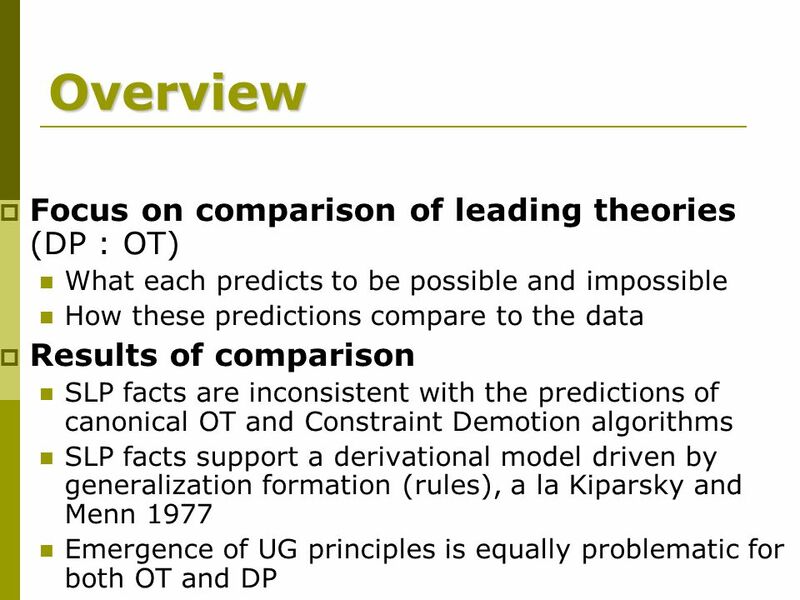 Universals constrain change, change results in typological generalizations. Lombardi, Linda. 2001. 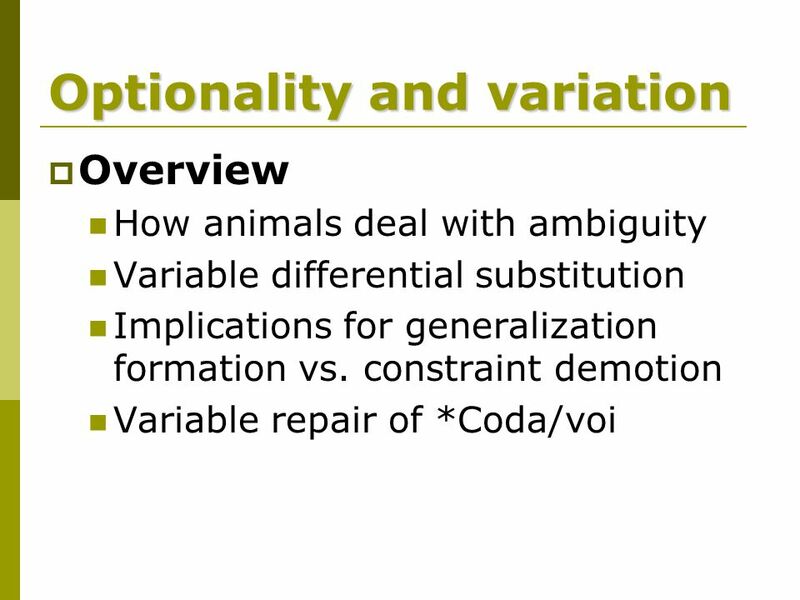 Why Place and Voice are Different: Constraint-Specific Alternations in Optimality Theory. In Lombardi, Linda, ed. 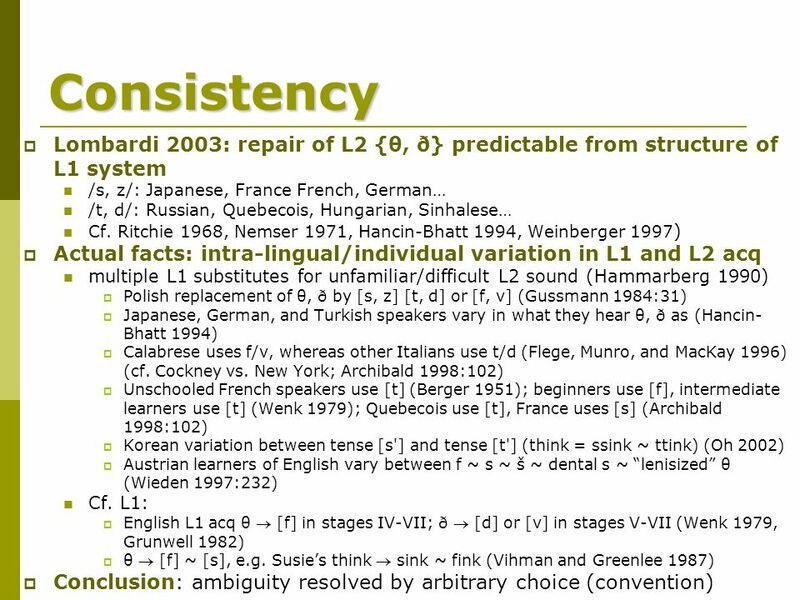 (2001) Segmental Phonology in Optimality Theory: Constraints and Representations. Cambridge: Cambridge University Press. Lombardi, Linda. 2003. 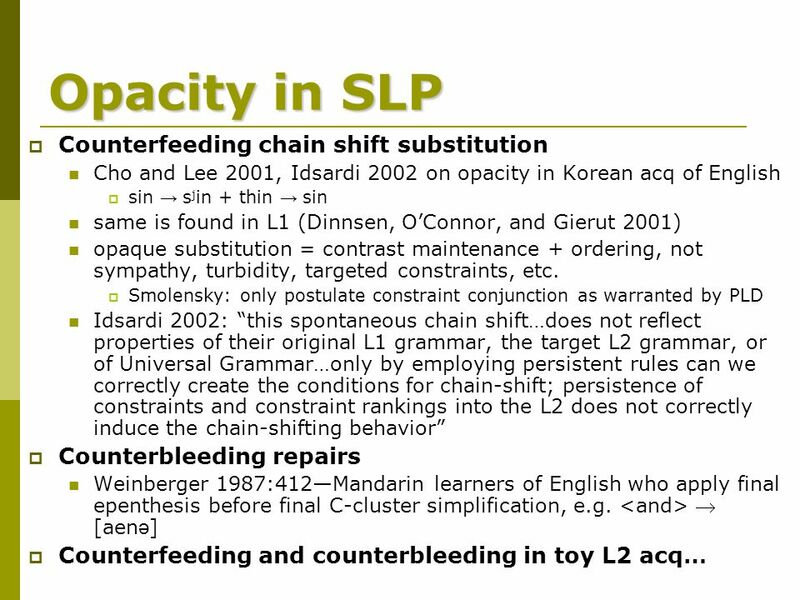 Second language data and constraints on manner: Explaining substitutions for the English interdentals. Second Language Research 19:225-250. Łubowicz, Anna. 1999. Derived environment effects in OT. The Proceedings of the Seventeenth West Coast Conference on Formal Linguistics, ed. by Kimary Shahin, Susan Blake and Eun Sook Kim, 451-65. Stanford, CA: Center Study Language & Information. [Rutgers Optimality Archive 239]] Major, Roy. 1987. A model for interlanguage phonology. In G. Ioup & S. Weinberger. (Eds.) Interlanguage Phonology (pp 101 - 124). Rowley, MA: Newbury House Publishers. Morrison, G. S. (2005, May). 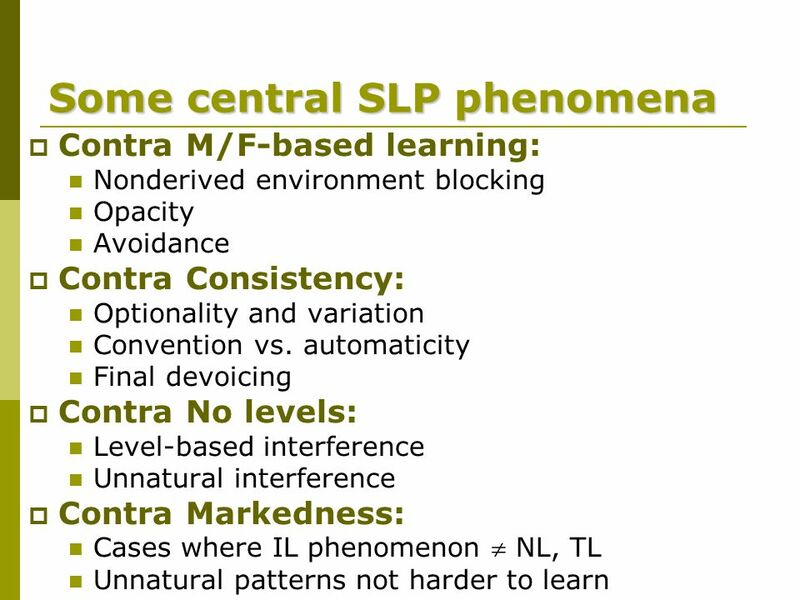 Phonetic naturalness and phonological learnability. Paper presented at The 13th Manchester Phonology Meeting (mfm 13), Manchester, UK. Nguyen, Thu and John Ingram. 2004. A corpus-based analysis of transfer effects and connected speech processes in Vietnamese English. Proceedings of the 10th Australian International Conference on Speech Science & Technology, Macquarie University. Pater, Joe and Anne-Michelle Tessier. 2005. Phonotactics and alternations: Testing the connection with artificial language learning. In Kathryn Flack and Shigeto Kawahara (eds. ), University of Massachusetts Occasional Papers in Linguistics 31:1-16. Pycha, Anne, Pawel Nowak, Eurie Shin, and Ryan Shosted. 2003. Phonological Rule-Learning and Its Implications for a Theory of Vowel Harmony. WCCFL 22 Proceedings, ed. M. Tsujimura and G. Garding, pp. 101-114. Somerville, MA: Cascadilla Press. Rubach, J. 1984. 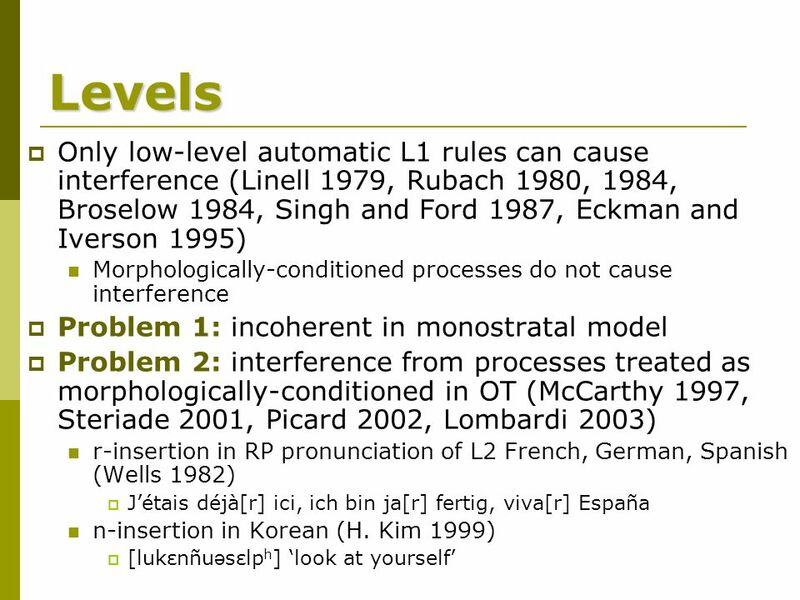 Rule typology and phonological interference. In Theoretical issues in contrastive phonology, S. Elliason (ed), 37-50. Heidelberg, Julius Groos Verlag. Seidl, A. and E. Buckley. To appear. On the learning of arbitrary phonological rules. In Language Learning and Development. Singh, Rajendra and Alan Ford. Interphonology and phonological theory. In Sound patterns in second language acquisition, James and Leather, eds., 163-172. Dordrecht: Foris. Smith, Bruce, Darcie DeMille & Amy Roberts, Ann Bradlow & Tessa Bent. 2005. Devoicing in word-final voiced stop targets produced by native and nonnative speakers of English. http://www.sfu.ca/~spchlab/A54.pdf Smith, Caroline. 1997. The devoicing of /z/ in American English: effects of local and prosodic context. Journal of Phonetics 25.4:471-500. Stark, J. 1974. Aphasiological evidence for the abstract analysis of the German velar nasal. Wiener linguistische Gazette 7:21-37. Tarone, E. 1976. 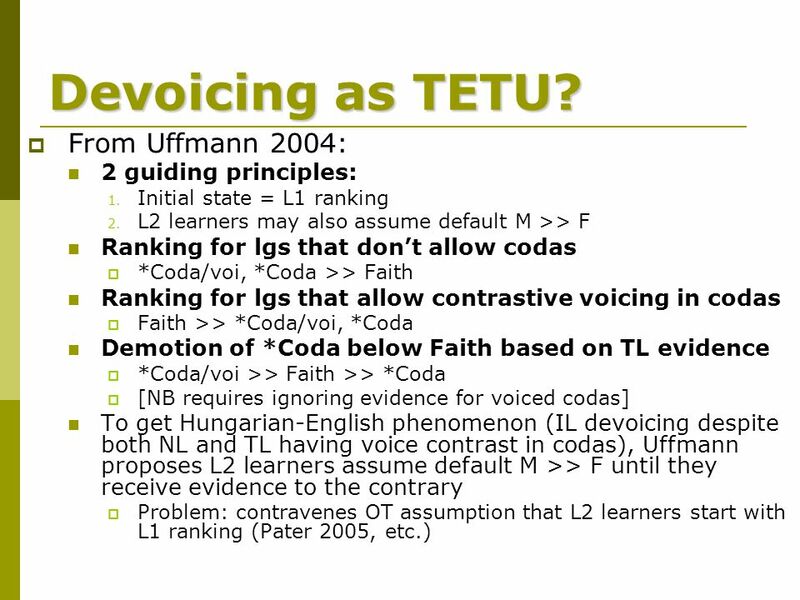 Some influences on interlanguage phonology. Working Papers in Bilingualism 8:87-111. Tarone, E. 1988. Variation in interlanguage. London: Edward Arnold. Tropf, Herbert. 1987. Sonority as a variability factor in second language phonology. In Sound patterns in second language acquisition, James and Leather, eds., 173- 191. Dordrecht: Foris. Uffmann, Christian. 2004. 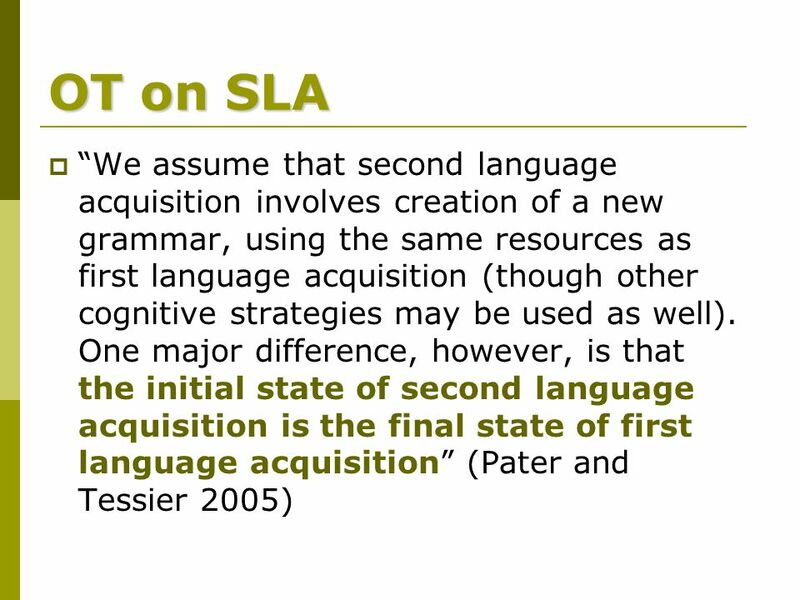 Re-Evaluating Transfer in SLA. Talk presented at the Montreal Dialogues workshop, Université du Québec à Montréal. Vihman, Marilyn and M. Greenlee. 1987. Individual differences in phonological development: ages one and three years. Journal of Speech and Hearing Research 30:503- 521. Weinberger, Steven. 1987. The influence of linguistic context on syllable simplification. In G. Ioup & S. Weinberger (Eds.) Interlanguage Phonology (pp 401-417). Rowley, MA: Newbury House Publishers. Wieden, Wilfred. 1997. Austrian learners’ development of phonological representations for English. In Second-Language Speech: Structure and Process, Allan James and Jonathan Leather, eds., 229-239. Berlin: Mouton de Gruyter. Wilson, C. 2003. Experimental Investigation of Phonological Naturalness. In Proceedings of the 22nd West Coast Conference on Formal Linguistics, G. Garding and M. Tsujimura (eds), 533-546. Somerville, MA: Cascadilla Press. Xu, Zheng. 2004. The Interlanguage Phonology of Mandarin Learners of English and the Gradual Learning Algorithm. 9th Conference on Laboratory Phonology. Yavas, M. (1994). Final stop devoicing in interlanguage. In M. Yavas (Ed. ), First and second language phonology (pp. 267–282). San Diego, CA: Singular. 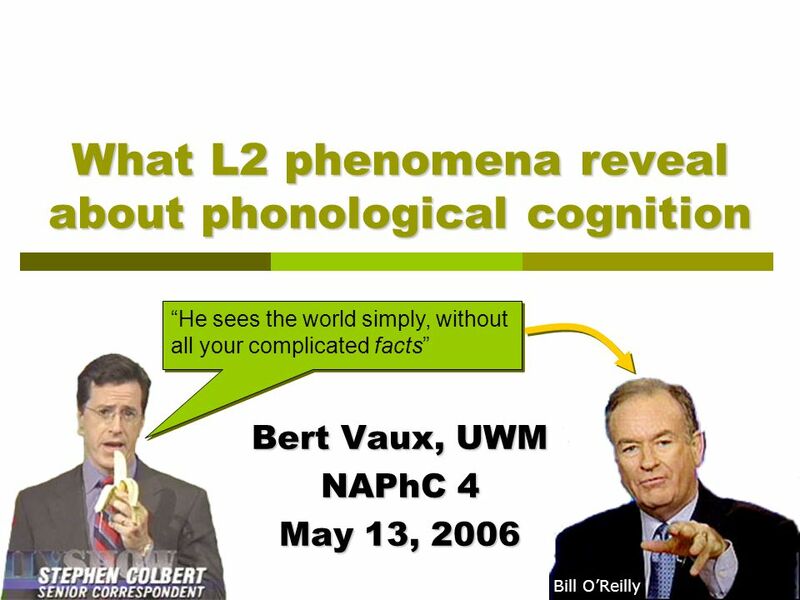 Download ppt "What L2 phenomena reveal about phonological cognition Bert Vaux, UWM NAPhC 4 May 13, 2006 “He sees the world simply, without all your complicated facts”"
Optimality Theory Presented by Ashour Abdulaziz, Eric Dodson, Jessica Hanson, and Teresa Li. Tone perception and production by Cantonese-speaking and English- speaking L2 learners of Mandarin Chinese Yen-Chen Hao Indiana University. 1 Language Transfer Lan-Hsin Chang National Kaohsiung University of Applied Sciences. Modified Approximants in L2 Spanish Teacher Talk: What are Students Hearing in the L2 Classroom? Meghan V. Huff Department of Linguistics University of. Infant sensitivity to distributional information can affect phonetic discrimination Jessica Maye, Janet F. Werker, LouAnn Gerken A brief article from Cognition. Speech perception 2 Perceptual organization of speech. Do Children Pick and Choose? An Examination of Phonological Selection and Avoidance in Early Lexical Acquisition. Richard G. Schwartz and Laurence B. Leonard. Phonological Effects in Intersentential Codeswitching Sonia Colina and Jeff MacSwan Arizona State University/ University of Arizona and Arizona State University.